Day three concluded the 9th BU23 Championships, with the two favourites claiming their first BU23 titles in two great battles in front of packed crowds at Hunts County SC. Elise Lazarus fought back from 0-1 and 1-2 down against 2nd seed Kace Bartley in the 44min Women’s final. Bartley snatched the 1st having been well down and took full advantage of Lazarus’ casual unforced errors that crept in. A more consistent 2nd game from the #1 seed brought it back to 1-1, only for Bartley to respond positively in a close 3rd game and forge another lead closing out 11/9. Bartley lost her advantage and all the momentum she had built in a disjointed 4th game, with the referee’s becoming increasingly involved in the contest. 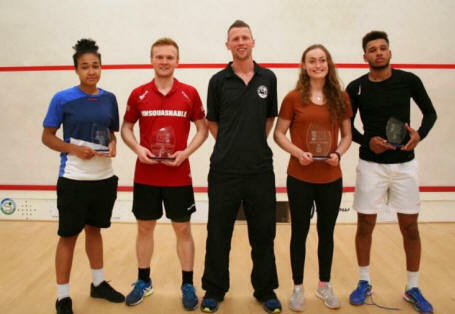 At 2-2 a poor start from Bartley handed Lazarus a great platform at 5/0 up, and she closed out 11/5 to become the youngest British Under 23 Champion in the 9 year history of the event @ Hunts County SC. Joel Makin weathered a spirited Richie Fallows fight back from 0-2 down, and clinched the National title on extra points in a dramatic and tense 4th game of a wonderful last match of the Championships. 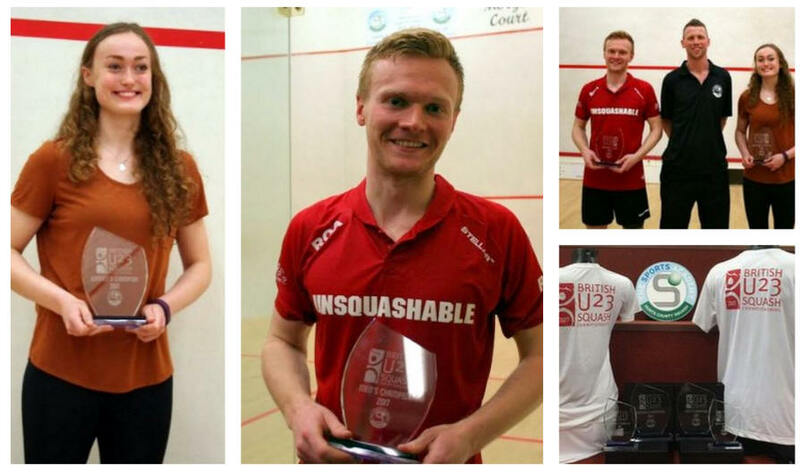 Two close games both went to #1 seed Makin, with the Welshman producing mature and disciplined squash in the key points at the end of both games to close out both 11/7, and leave Fallows facing a massive mental and physical challenge. The 2nd seed responded with more assertive and positive squash, to take the 3rd 11/8 as the tension built dramatically. Nothing separated the players in the 4th, with the increasing physicality (and debate on ‘lines’ to/from the ball) testing the referee and players relationship to the point of “Conduct Warnings” being given to both players ......... only ramping up the pressure and tension on court and in the crowd! Fallows lost the chance to take in to a decider with a game ball at 10/9, and when presented with two opportunities to isolate and shut out Fallows, Makin converted both to claim the Under 23 title in his last opportunity to do so. Day two of the event marked the Quarter and semi-finals in both competitions and the matches definitely lived up to their billings, with some fantastic encounters! 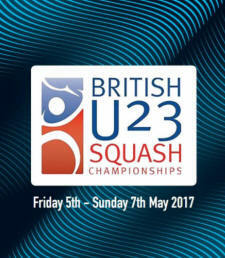 The upset of the morning in the men’s draw came from Joe Brooke scalping 3/4 seed Harry Falconer in straight games, setting up a semi-final spot against top seed Joel Makin, who defeated Adam Corcoran 3/0. 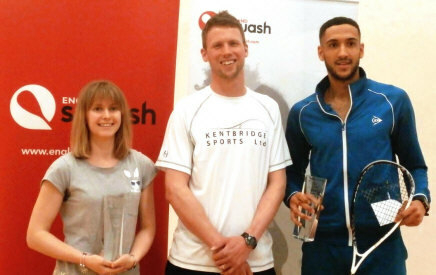 Ashley Davies and Richie Fallows met in the opposite semi, after both won without dropping a game. Although, Nicholas Wall made life tough for second seed Fallows, taking two of the games into tie-breaks over three hotly contested games. 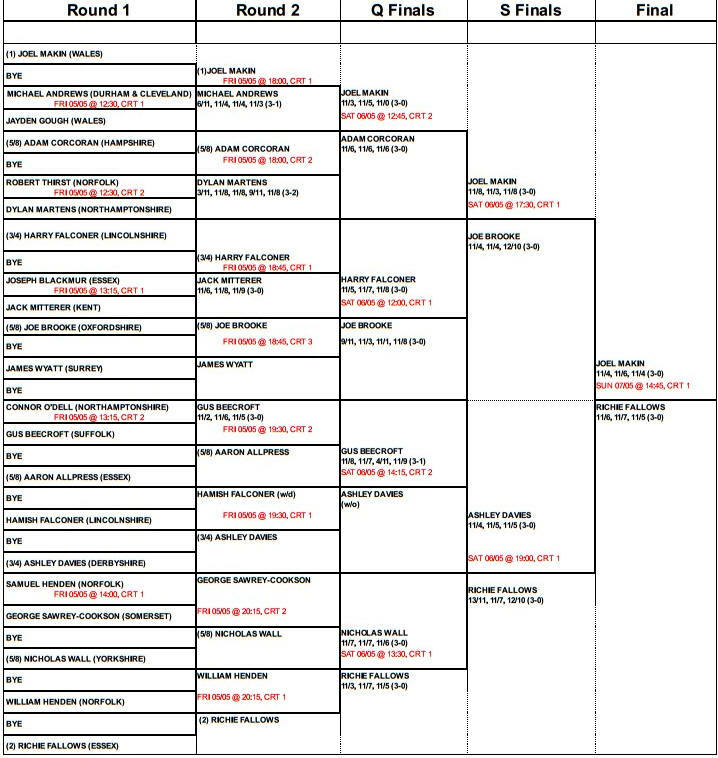 Over in the Women’s draw there were no upsets to the seedings but there were some hard fought battles with all of the top seeds, other than Kace Bartley, taking four games to win. Alicia Mead and Jasmine Hutton both recovered from a game deficit to defeat Charlotte Jagger and Mari Taylor respectively. 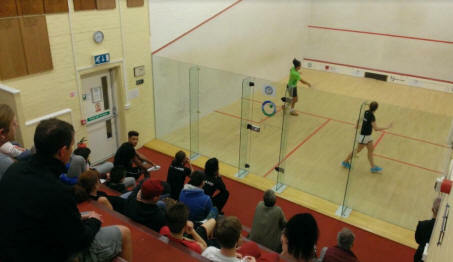 The finalists for both draws were decided in the evening session of play, with the top seeds in both showing their quality in front of great crowds. 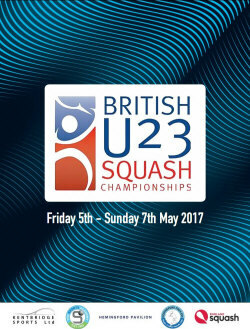 Top seeds Joel Makin and Richie Fallows will meet in the Men’s and Elise Lazarus will take on Kace Bartley in the Women’s final. Makin continued to cut through the top half of the draw and dispatched this morning’s giant killer Joe Brooke 3/0 in just under the half an hour mark. Richie Fallows was in equally fine form, taking out Ashley Davies in three. Lazarus, fresh from taking silver in the individual European Junior Championships, backed up this morning’s win with another impressive 3/1 win. 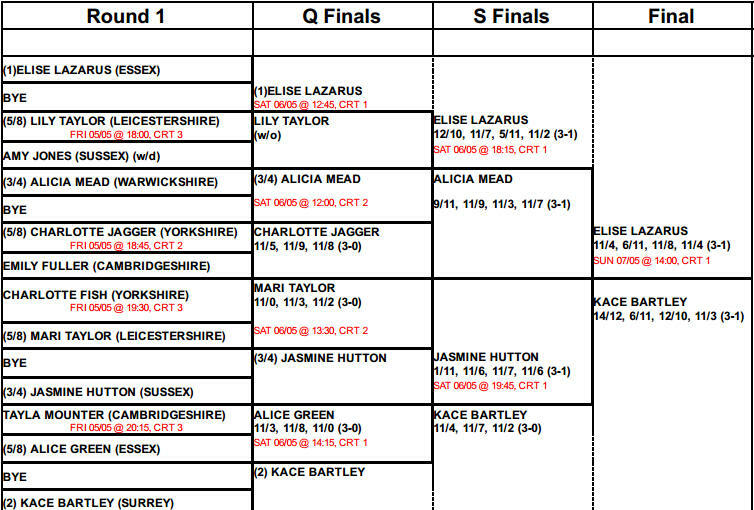 Kace Bartley managed to take down Jasmine Hutton in the longest match so far in the Women’s event, convincingly taking the forth set after a nip and tuck first three games. 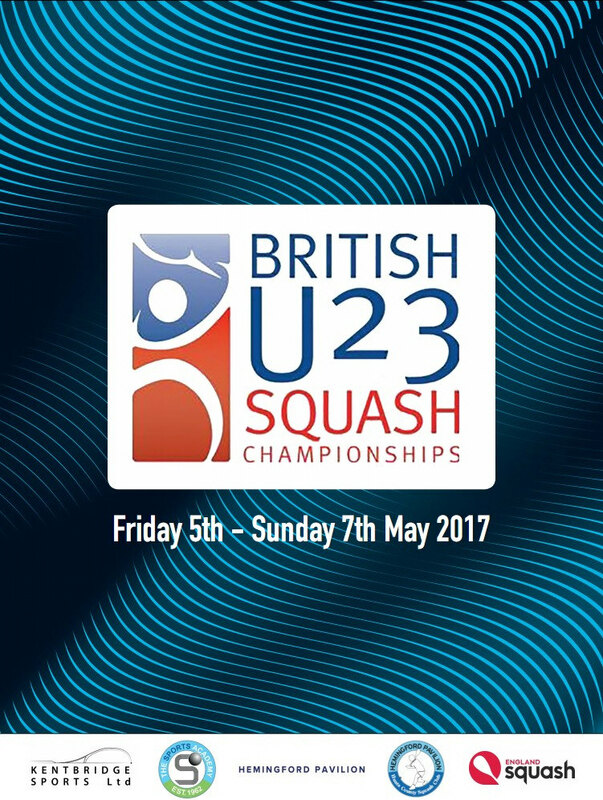 Sunday’s finals will see new British U23 Champions crowned in both categories and promise highly entertaining and competitive matches! 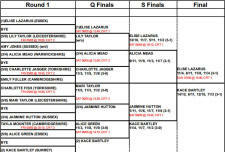 Play-off rounds start from 11:30am, with the Women’s final at 2pm and the Men’s following on at 2:45pm. This years’ event began with the Men’s Open 1st round, with 10 players competing for 5 places in the Men’s 2nd round and the opportunity to compete in the Monrad phase for places 1-16. Robert Thirst (Norfolk) & Dylan Martens (Northamptonshire) provided the match of the round in a 53min battle that went to wire, with Martens narrowly taking the victory 11/8 in the 5th. Second round places in the Main Draw were also secured by Michael Andrews (to play Joel Makin), Jack Miterer (to play Joe Brooke), Gus Beecroft (to play Aaron Allpress) and George Sawrey-Cookson (to play Nick Wall). The busy evening session saw every Men’s player take to the court for the second round of matches and all bar the top four seeds competing in the Women’s first round. 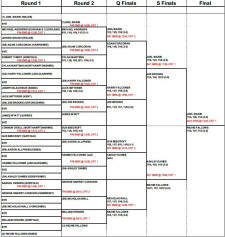 All the evenings’ matches went to seeding, with the exception of Gus Beecroft taking out 5/8 seed Aaron Allpress over four games, in the longest match of the night. 5/8 seed Joe Brooke had a bit of a scare after dropping the first game against James Wyatt, but won the next two convincingly before closing out a tight forth game. In the Women’s draw, local hopes were dashed as Hunts County players Emily Fuller and Tayla Mounter both lost in three to 5/8 seeds Charlotte Jagger and Alice Green respectively. The line up for tomorrow’s Quarter-finals offers what are bound to be some fantastic encounters as players fight for a place in the semi-finals! The action starts from 12am. With both 2016 champions - Emily Whitlock and Declan James - having passed out of the age group, this year's event guarantees to crown two new National Champions. Continuing the successful and very popular format reflecting the PSA World Tour, both the Men’s & Women’s competitions will have the same prize fund (4.4k in total over the two categories) and be played on a 17” tin. The Women’s event benefitted massively from these changes in 2016, and the aim is to keep that momentum into the 2017 event. Hunts County SC will again bring the best British players to the beautiful setting at The Pavilion in Hemingford Grey, Cambridgeshire. Always aiming to develop the event this season's Championships will again blend elite performance on court, with great facilities in a community environment.